The Cumberland & Dumfriesshire Farmers Mart had forward 1,630 ewes with lambs at foot at their sale at Longtown on Tuesday 31st May, 2011. Smaller numbers, plenty buyers trade excellent. Hoggs with singles sold to a top of £98 Greyface from Messrs Ridsdale, Yewtree, others to £92 Briggle; Texel £97, £95, £92 Aimshaugh, £91 Kilncroft; Suffolk £92 Kilncroft, £88 Bayles. Hoggs with twins to £65 for Greyface from Prospect. Shearlings with twins to £80 for Texels from Low Brooms; Greyface £75 Raby Grange, £68 Collin Bank and Bayles. Shearlings with singles to £80 for Texels from Low Brooms, £78.50 South Mains; Greyface £71 Prospect. Ewes with singles to £80 for Texels from Low Brooms, £78.50 South Mains; Greyface £61 Low Old Shield; Hill Cheviot £69, £61.50 South Mains; Blackface £60 Bayles; Swaledale £47 Bayles. Ewes with twins to £80 for Texels from Low Brooms, £78.50 South Mains; Greyface £72, £70 Aimshaugh; Suffolk £72 Low Old Shield; Hill Cheviot £69 South Mains; Swaledale £62 Bayles; Blackface £50 Bayles, £48 Castlefairn. Geld hoggs to £102 for Texels from Kilnhill. 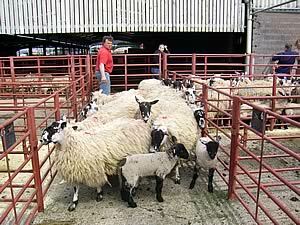 Cast ewes to £75 South Mains. Store hoggs to £47.50 from South Mains.